Brock Lesnar may be preparing for a showdown against Finn Balor at WWE Royal Rumble in January but lately he’s been back at his old stomping grounds at the University of Minnesota wrestling room. The 2000 NCAA champion wrestler went back to his roots this week with a session at the Gophers training facility where he faced one of the best young heavyweight wrestlers in recent history. Gable Steveson — a freshman at the University of Minnesota — just recently took over the No. 1 ranking in the country as he moved to 20-0 on the season earlier this week. As the NCAA wrestling season continues, Steveson got some mat time in with Lesnar, who was a ferocious monster during his college days while racking up an incredible 106-5 overall record including his championship season as well as being a two-time All-American at Minnesota. Lesnar has made scarce appearances on Monday Night Raw since winning back the WWE Universal championship but obviously he’s staying in shape while he’s been away. There are still plenty of questions about Lesnar’s future in WWE after WrestleMania because he was originally expected to return to the UFC for a heavyweight fight against current champion Daniel Cormier. That plan has been put on hold for now as Cormier deals with some injuries and Lesnar remains focused on his professional wrestling career. 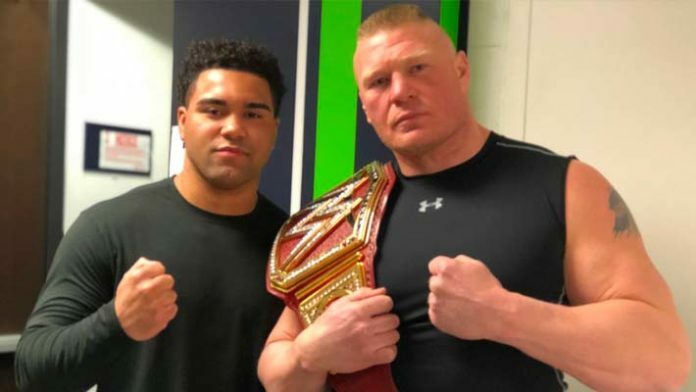 It’s unknown if that will continue after WrestleMania but Lesnar is obviously staying ready for the ring or the Octagon by working with the best heavyweight in college wrestling today.